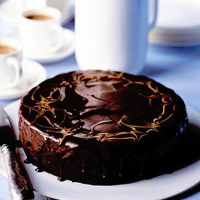 Our ultimate coffee-time cake is rich, moist and packed with chocolate. Preheat the oven to 180°C, gas mark 4. Grease and line the base and sides of a 20cm loose-bottomed cake tin or spring-form tin with non-stick parchment paper. Put the raisins and Marsala in a small pan, bring to the boil. Remove from the heat and leave to cool. Melt 175g of the chocolate in a bowl over a pan of hot water with the milk. (Alternatively, use the microwave.) Remove from the heat and leave to stand for 10 minutes. Grind the almonds in a food processor. Using an electric whisk, beat 200g of the butter in a bowl with 225g of the sugar until pale and creamy. Beat in the ground almonds, flour, egg yolks, vanilla and melted chocolate. Whisk the egg whites in a thoroughly clean bowl until peaking. Gradually whisk in the remaining muscovado sugar, a tablespoonful at a time. Stir the raisins and any unabsorbed Marsala into the chocolate mixture. Using a large metal spoon, fold in a quarter of the egg whites to lighten the mixture a little. Carefully fold in the remaining whisked whites until the ingredients are just combined. Turn into the tin, spreading it gently to the edges. Bake for about 1 hour or until the surface has a firm crust which is beginning to crack, but feels slightly soft underneath when gently pressed. Leave to cool in the tin. Put the milk chocolate in a bowl over a pan of hot water and leave until melted. Put the remaining plain chocolate in a small, heavy-based saucepan with the remaining butter and the golden syrup. Melt very gently, stirring frequently until smooth. Transfer the cooled cake to a serving plate, peeling the lining paper away carefully. Pour the plain chocolate over the cake and spread to the edges with a palette knife so plenty of drips fall down to the plate. Use a teaspoon to drizzle the melted milk chocolate around the top edges of the cake. Marble lightly into the dark chocolate using a skewer or the tip of a teaspoon. The butter should be very soft (just holding its shape), so the cake mixture is not too firm to fold in the egg whites. Bought ground almonds can be used as a shortcut instead of grinding your own. Avoid removing the cake from the tin before it has cooled or it might deflate slightly. Store the cake in a cool place for up to 3-4 days. Avoid putting it in the fridge as this produces a firmer texture. that will complement the chocolate.